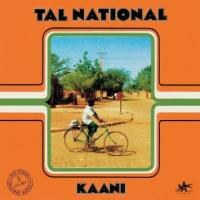 Tal National hails from the small west African nation of Niger, where the band is highly regarded and hugely popular; their first two albums were recorded for domestic release, with Kaani following suit in 2011. Now this album sees its way to an international release, and we’re all the luckier for it. This is a terrific record, energetic and dense, filled with virtuoso musicianship and heartfelt singing. The band’s basic attack comes through its razor-sharp guitar licks, which are generally played in counterpoint - one lays down a repetitive rhythm groove, while the other adds a trebly layer atop. Beneath this is some straightforward bass playing (sadly, a bit lost in the mix) and energetic percussion. Talking drum in particular stands out, but there is also a drum set to motor things along. The overall effect is one of restless energy and enthusiasm. Vocalist/band leader Almeida possesses a powerful, slightly strident voice that floats above the hubbub and cajoles, exhorts and coaxes the listener. With lyrics and song titles in the local tongue, the meaning will be lost to Anglophones, but that’s hardly important as the sounds can be enjoyed on a purely musical level. Lead track “Banganeseba” follows this template for more than eight and a half minutes, a statement of purpose that never loses its direction or flags in energy. That’s par for the course here, as the eight songs on display routinely approach or pass the six-minute mark but retain their infectious zest. Instrumental solos as such are few, although there are many spontaneous percussive outbursts and guitar accents punctuating the bridges between verses. Highlights are many. Title track “Kaani” brings an easygoing lope into the rhythmic mix, along with a soaring, joyous vocal performance. The excellent “Salkafada” slows the tempo a bit, bringing a more introspective vibe into play, along with unison call-and-response vocals that make it one of the most hypnotic, irresistible tunes in the whole set. The bass is more noticeable as well, adding a third counterpoint to the interplay of the guitars and making the track a standout. The good times don’t end there, either, with the midtempo lilt of “Tchana” bringing focus onto both the vocals and the flexible talking drums, who provide the tune with a constant undercurrent of popping rhythm. Tal National are a group of musicians who clearly love playing together; theirs is the kind of instinctive tightness that comes only from shared history, with each instrument adding to the whole in turns but never stepping on anyone else. If any criticism could be leveled at the album, it’s that the songs tend to be structured similarly: A brief drum or guitar intro leads into the main groove, where the band then parks for the duration as Almeida sings. Songs don’t particularly build or crescendo; they just jog along for a while, then stop. There are no sections, no transitions from one part to another. Now, these are all characteristics of a great deal of African pop, so it’s probably unfair to call them criticisms. However, newcomers to this type of music might feel a little disoriented. That said, though, the album is well worth a listen. Even fans of African popular music will be excused for not having heard of this band before – with a solidly local presence until now, Tal National has been all too easily overlooked on the world stage. This record should help rectify that. Any chance that those first two albums could be reissued for the rest of us to enjoy? Hey, we can hope.